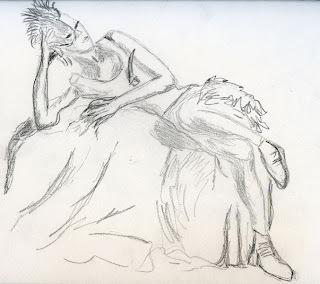 In the life drawing classes I’ve taken and in the books I’ve read on the subject, the recommended media are always loose and broad like charcoal, soft pencils or big splashy brushes. We are told to stand at the easel and draw with the whole arm, making large strokes, not tiny lines with the hand. 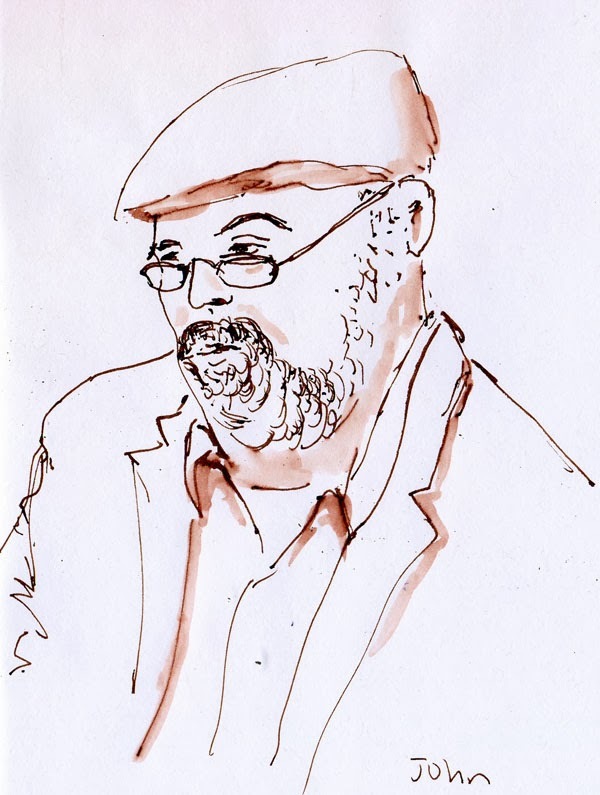 The instructors and authors always say that doing life drawing practice is not about making drawings of a recognizable person. 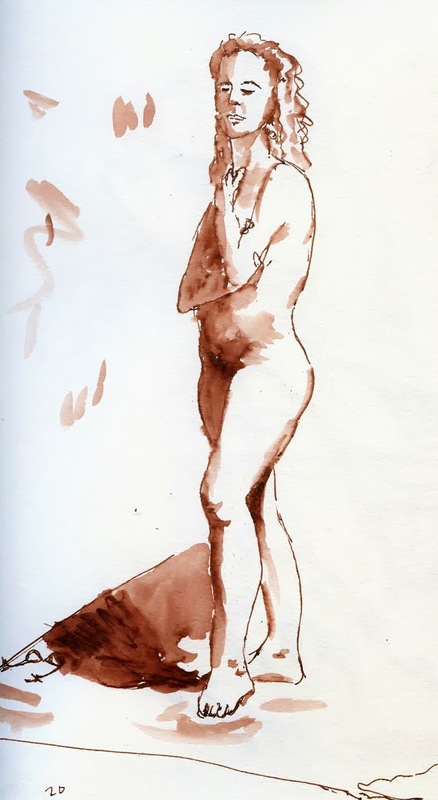 It’s about seeing where the model’s weight is in the pose, feeling the gesture in your own body, transferring that feeling to the paper with a loose, expressive mark, etc., etc. I get all that, and I understand the value of it. 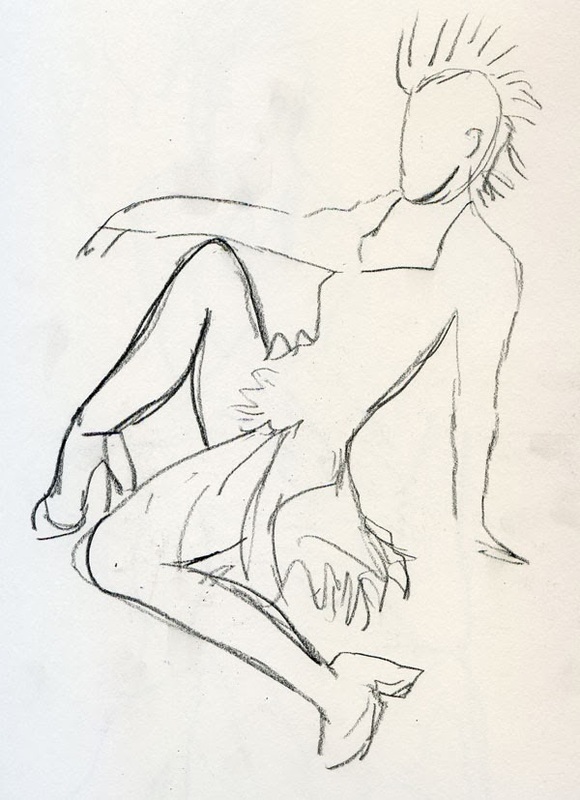 And while I filled a whole punch card at Gage’s life drawing studio and half of the second one, I was a good student who followed all the rules. But today, something happened. (Maybe Halloween brings out the rebel in me.) 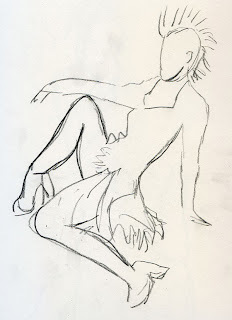 After a bunch of loose two-minute and five-minute poses, I suddenly said to myself, What if I feel like actually trying to capture the model’s likeness? What if I feel like using my favorite Sailor pen to make tight, controlled marks? Bwaa-haa-haa! I’m going to! While lots of houses try to outdo each other with Christmas lights every holiday season, one house in my neighborhood does Halloween in a big way. Just east of Fifth Avenue Northeast on Northeast 80th, it hardly has any competition, at least in Maple Leaf. Gravestones and coffins are an annual standby, but the owner brings out a few new things each year, usually around a theme. 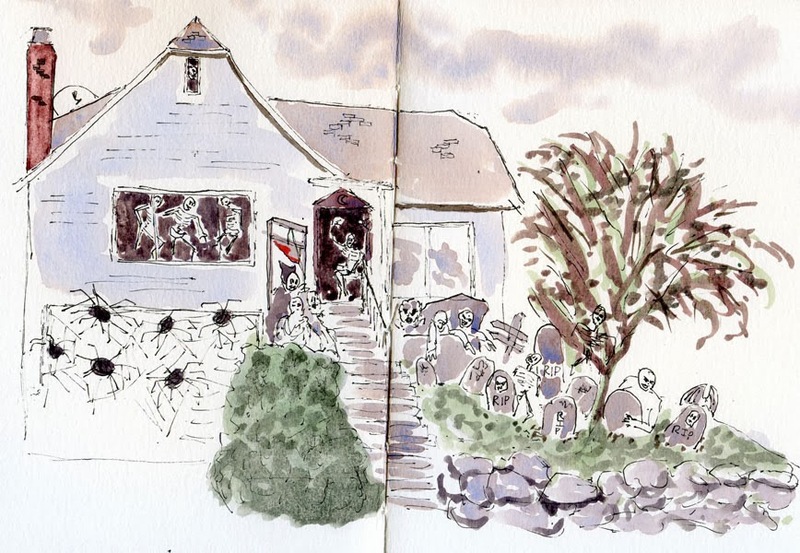 This year the theme seems to be skeletons – I counted 11, including the skull in the attic window. The scariest one – at least for young trick-or-treaters – is probably the one seated in the doorway, since they will have to stand right next to it to ring the doorbell (of course, the skeleton is waving, so how unfriendly can it be?). The bloody guillotine is a nice touch. 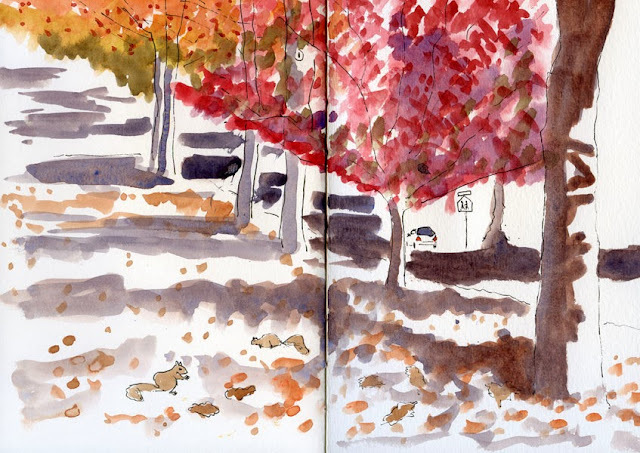 As I was sketching his house, the owner came out to walk his dog and saw me across the street, so he came over to take a peek. I told him that I look forward to his decorations each year, and he said he’s been doing it for 20 years. Our little deck, which extends from our upstairs bedroom facing south, gives us a view of both sunrise and sunset, as long as it’s not completely overcast. This morning was a perfect one – just enough clouds to reflect the colors, but not enough to obscure them. The bright sunshine was deceptive. The trees waving back and forth were a clue, but after days of endless fog, I guess I was just too happy to see the clear blue sky again that I thought those trees were kidding. But when I stepped out of my car to catch a quick sketch of a few shivering maples, I shuddered myself in the harsh wind and decided I could sketch them just as well from inside my car. Disappointed that the outdoors weren’t as inviting as I had thought, I stopped at Zoka Coffee for a more leisurely sketch. My third handbound sketchbook (Coptic binding). As I mentioned last week, I only needed a few more sketches to fill a sixth signature, enough for another sketchbook. 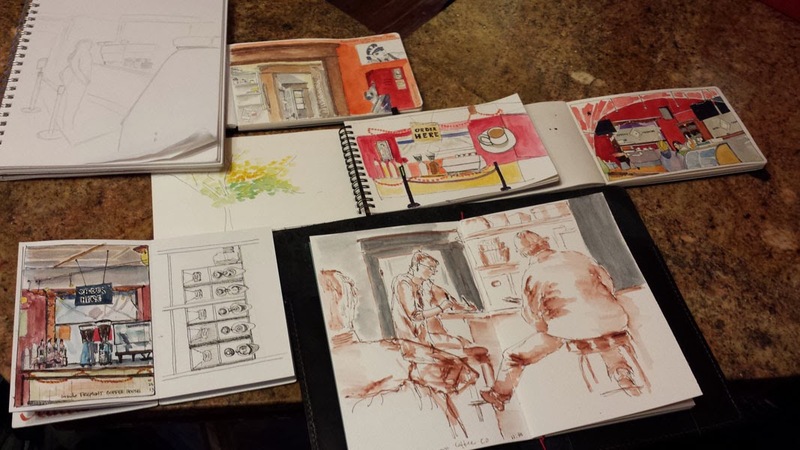 Using my streamlined process, my third handbound sketchbook came together relatively quickly. The final Coptic stitching would have been done a little sooner if I hadn’t noticed an error that I had been making consistently all along. I’m not going back to fix the first two sketchbooks since the error hardly shows (and I’m not one of those people who points out an error as soon as I show you something I’ve made, so you’ll never find out where it is! ), but once I realized the step I’d been missing, I wanted to undo and restitch the couple of signatures I’d already done. Now I finally know how to do Coptic stitch correctly! It should be a breeze next time. 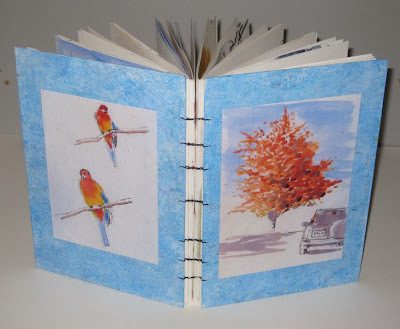 Since I’m on the subject of handbound sketchbooks, it’s a good time to talk about paper. I’m almost finished with the last of the four signatures I had stitched up with a variety of papers so that I could compare them more easily. As I had tentatively concluded a few weeks ago, they all perform well with wet washes, and they all serve me well in the ways I like to work (if I used more aggressive techniques like scrubbing, my story might be different). 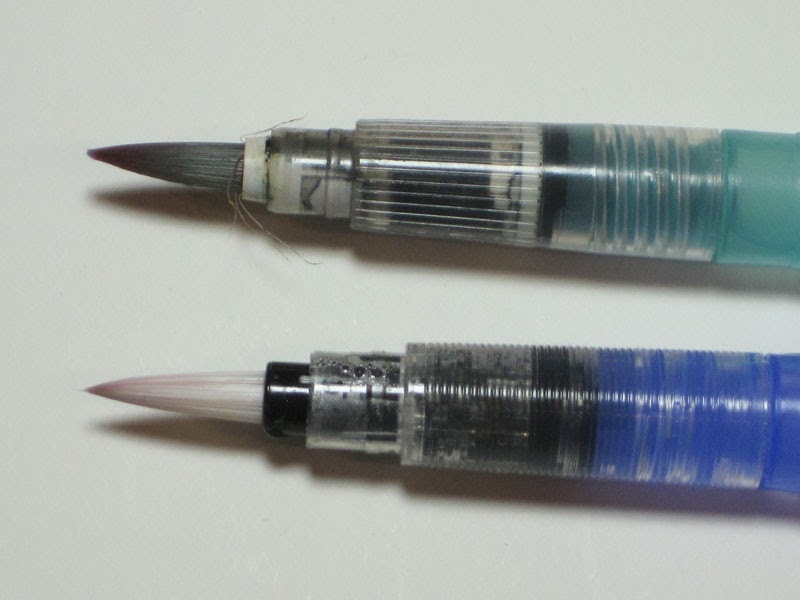 But I definitely prefer the texture of the Canson XL, which is the smoothest of the three I’ve been testing, because it doesn’t catch my fountain pen nib. 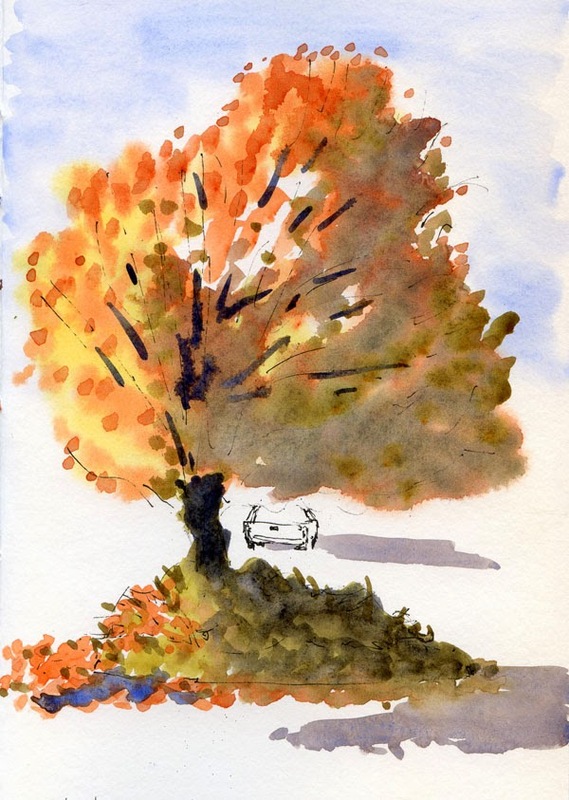 This experience has made me a little braver about trying hot-press papers, which I’ve always heard are more difficult for novice watercolor painters to use because they are less forgiving, and paint is harder to control. Frankly, I don’t think cold-press papers are very forgiving, either, so maybe it won’t matter. In any case, I picked up the smallest size single sheet I could find of pricey Arches 140-pound hot press and stitched it up into a signature. That paper is much harder to fold than any of the other papers I’ve made into signatures, so I’m not sure it’s a good solution for handbinding. But I’m giving it a whirl. Stay tuned. 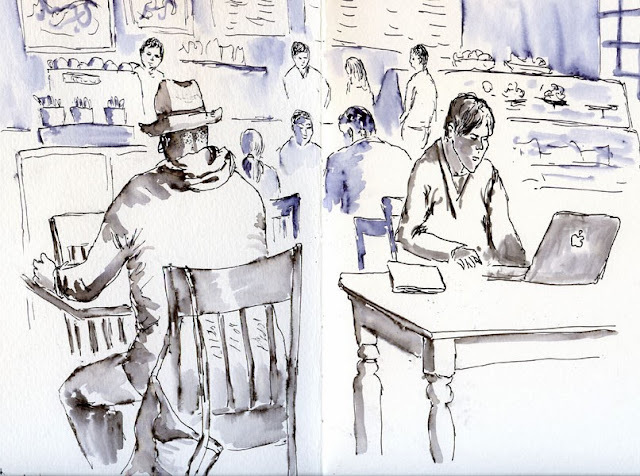 With its many small rooms and spaces, the Fremont Coffee Company is both a challenging interior space to sketch and a cozy place for a hot mocha on a cold, foggy morning. Several Friday sketchers ended up at the bar, where I attempted to sketch the front counter scene (below) and immediately regretted it. 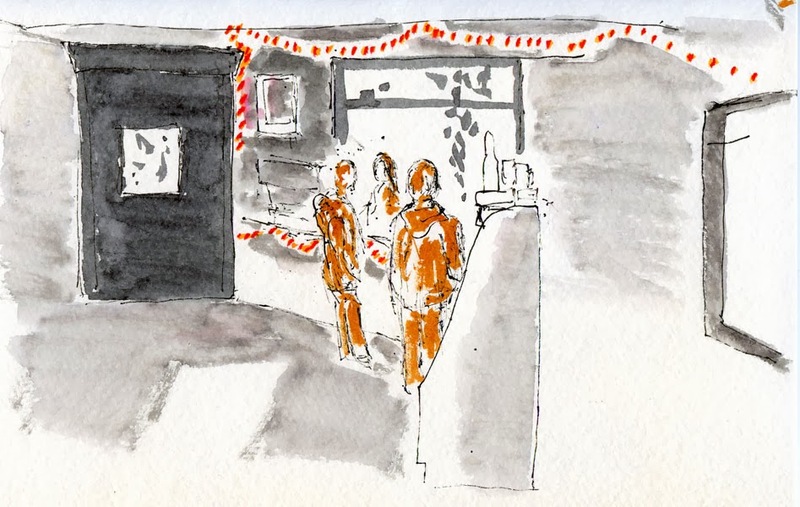 I had been attracted to the string of orange Halloween lights, but the general dimness and the perspective of the counter frustrated me. After that, I moved to a small side room looking out toward the bar I had just left. 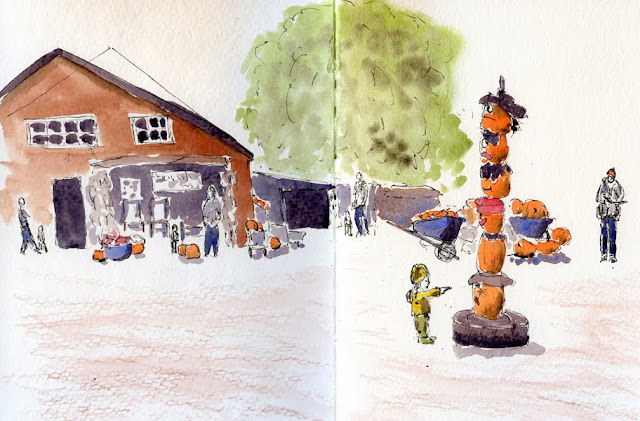 Knowing Lynne’s and Carleen’s sketching styles, I figured they’d be there a while, so they were safe to sketch. Kate usually documents our sketch gatherings, but she couldn’t make it today, so I tried my best to photograph our sketchbooks. Then we recruited a woman nearby to take a group photo, and she kindly obliged. 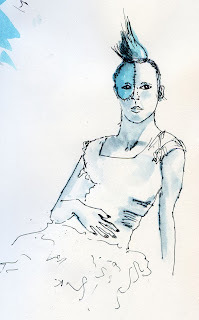 A few weeks ago when I was shopping at Artist & Craftsman Supply in the U-District, I picked up a flier for a new series of life drawing open studio sessions called “Pinup Figure.” Independently operated by Nell Rousseau, a model herself, the studio is in Artist & Craftsman’s classroom. The series offers models in themed costumes, and just in time for Halloween, October’s theme was “Pretty Ghoul.” Irresistible! I went. 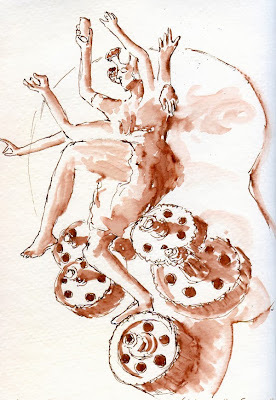 Although it wasn’t exactly Dr. Sketchy in ambiance – the beverages available were coffee and tea, not beer, and no whooping, hollering and door prizes – it was an ideal cross between traditional Gage-style life drawing and fun costumes. The studio was well-lighted, and we had plenty of easels, horses and chairs to use. Most important, our model, Fox, was excellent. Shadows in her partially black clothing were difficult, at times impossible, to see, but I loved sketching her bright blue Mohawk. 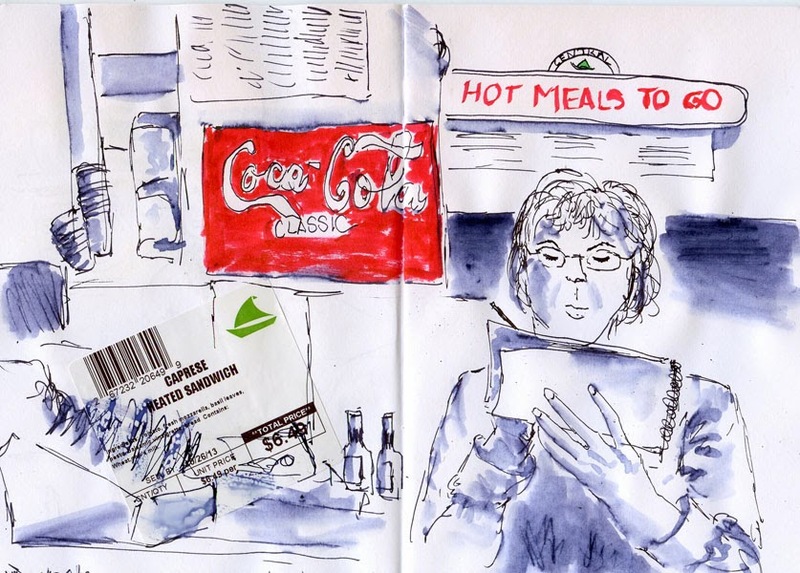 Natalie and I got together for lunch at Central Market to talk about our favorite activities – traveling and sketching – and figuring out ways to do more of both simultaneously. After we finished eating and strategizing, we both pulled out our sketchbooks and sketched each other. On the way home I stopped at Northgate for an errand, but I couldn’t even get out of the mall parking lot without spotting a tree to sketch. Our days may be numbered, but our number’s not up yet. So many trees, so little time! Not literally, course. 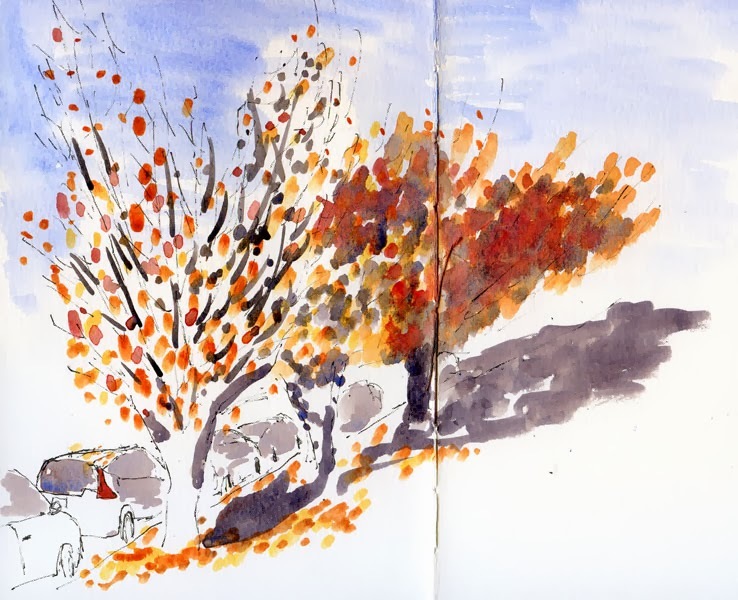 But with every tree I sketch, I keep thinking it may be my last of the season. Who knows when the weather will turn to continual rain as it often does in October; who knows when a windstorm will blow all the leaves off. 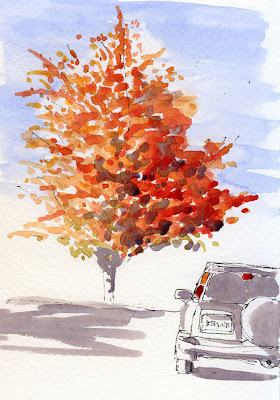 Feeling uplifted, I drove to a street near Green Lake where I often park for my yoga class. 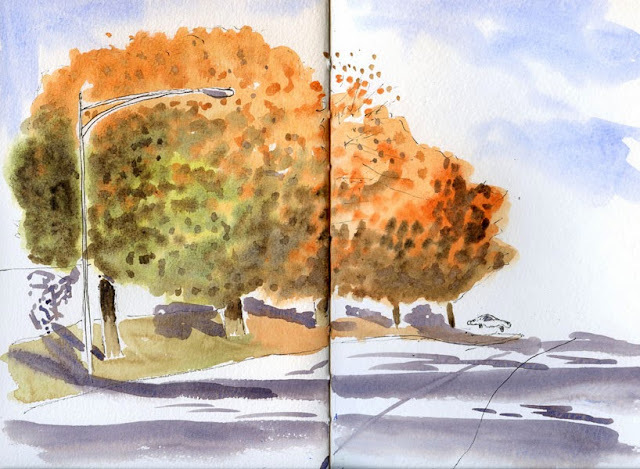 I’m usually rushing to get to class, so I don’t have time for a sketch, but I’ve been admiring the yellow and orange trees (cherries, I think) on both sides of the street. Now that I finally made time to sketch them, they were long past their prime. In fact, the tree I focused on was more bare than not. Like I said, their days are numbered. But with the sun at my back lighting up all that color, it’s hard to be gloomy and doomy. With a little time to fill before my yoga class, I went to nearby Revolutions Espresso because I remembered its comfy couch next to a big window that looked out over some trees that were now bright yellow. But when I got there – dangit! A guy with a laptop was sprawled all over "my" couch in his stocking feet, not looking like he was going to budge anytime soon. I exercised Sketcher’s Revenge: I sketched him. Bwaa-haa-haaa! As usual in the morning, it was foggy and gloomy as I got ready to leave for the Seattle Urban Sketchers gathering, and I was thinking about how nice it would be to have another cup of coffee and finish reading the funnies. 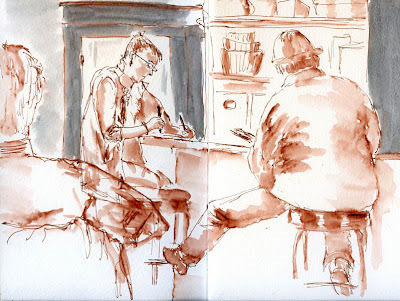 But since I didn’t get out yesterday for the 41st quarterly Worldwide Sketchcrawl (even by myself), I was itching for a sketch, so I pulled myself out of my chair. 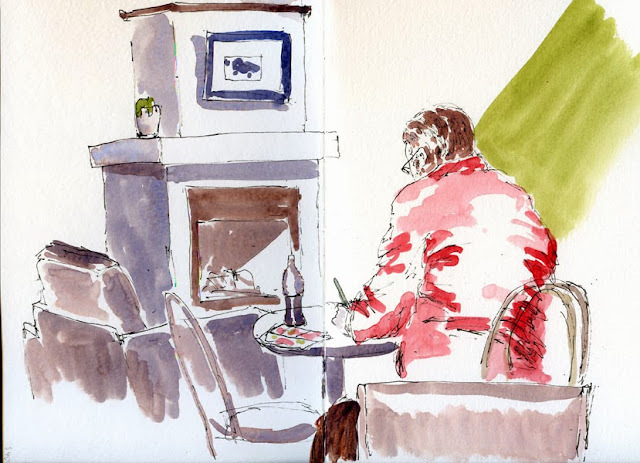 In fact, recalling how cold I was Friday sketching in the fog in Port Townsend, I pulled on tights under my jeans, down jacket and fingerless gloves. Paper note: The signature I sketched this in contains a mix of 140 pound papers, so the left and right sides of the sketch are on two different papers. I can’t see any difference in the way the paint went down, but where the difference is visible is in the surface texture. I used a water-soluble colored pencil on the foreground, and the Strathmore 400 (left side) shows a lot more pebbly grain than the Canson Montval (right side). I have only one more mixed-paper signature left after this one, so I’ll probably make some kind of assessment about papers soon. My second handbound sketchbook completed. Right on my predicted schedule, I filled six more sketchbook signatures between returning from Europe in July and September. And now that I’m filling them with 140-pound paper and therefore making each signature with three folded sheets instead of four, I’m completing them faster than ever. I don’t like the idea of lots of unbound signatures stacking up, so I needed a streamlined process for making covers and binding the books. Having just completed binding my second sketchbook, I think I’ve developed a process that works. First, the covers. Deciding how to make the backgrounds of the covers was relatively easy. A few years ago I had completed a body of work of collages made of torn up bits of paper with handwriting on them – letters, old planners, even school papers (go to my website by clicking the previous link to read the artist statement). 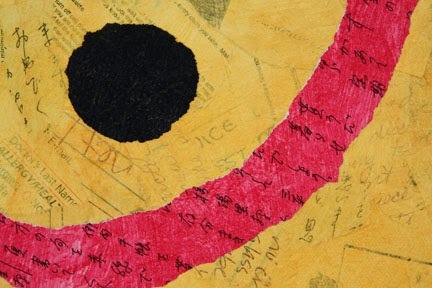 Below is a detail of one such collage. 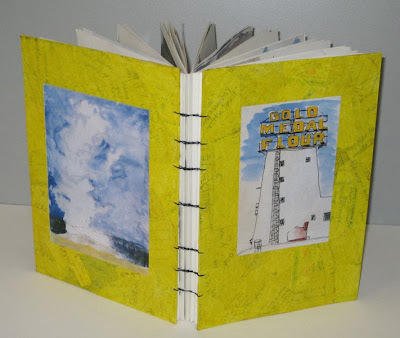 I still have piles and piles of those old papers left, as well as lots of acrylic paint and matte medium – why not use them to make the covers in the same way I used to make collages? 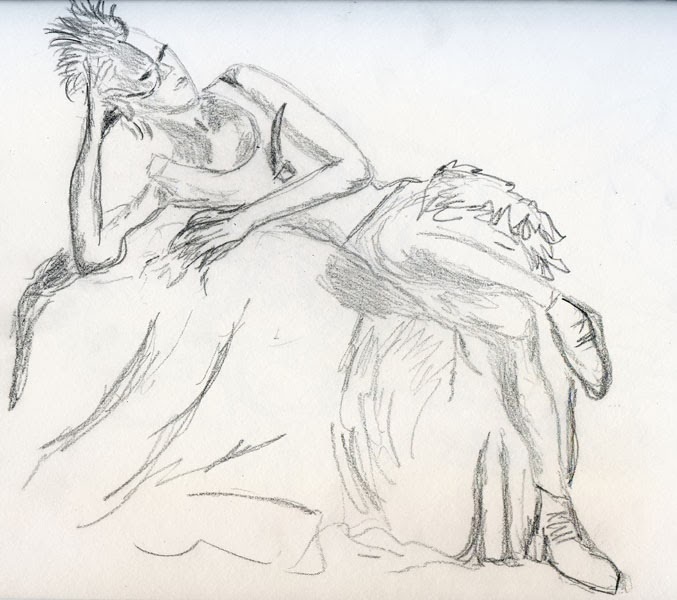 I also wanted to incorporate reproductions of a sketch or two on the covers. Thematically, that task was easy: I didn’t necessarily want the “best” or my “favorite” sketches; I wanted to use sketches that would somehow represent the contents of the pages between the covers. Since I had traveled to both the Twin Cities and Yellowstone during the period contained in the signatures I was binding, I chose one sketch from each location (both in a portrait format to fit the covers). Mechanically, however, the task was a bit more difficult. I could print a digitized image of a sketch with my inkjet printer, but inkjet ink is water-soluble, so it would bleed and run when I glued it to the cover with matte medium. Again, I went back to some experiments I had tried during my collage days and remembered that if I sprayed the inkjet image with acrylic varnish, the ink wouldn’t run. So, despite my general avoidance of spray-on substances that come in cans covered with skull-and-crossbones and other dire warnings, I took the printouts outdoors and sprayed them. That did the trick. I bought a stack of chipboards and cut them to size. I chose the sketches I wanted on the covers, printed the images and sprayed them with acrylic varnish. I painted one set of covers bright yellow to coordinate with the sketches I had chosen. After the paint dried, I glued the images in place. To protect the covers and give them a cohesive surface, I applied two coats of more acrylic varnish (not a spray this time, thank goodness). I drilled the covers and bound the book together with Coptic stitch (this last part is my favorite of the whole process). When I fill enough signatures for the next sketchbook (which will be in a matter of days, since I’ve filled more than five signatures since September), I only have to do Steps 3 – 6 above, which won’t take much time. I say this process won’t take “much time,” but of course it takes significantly more time (several hours per book) than going to the store and buying a sketchbook. But now that I’ve finished hand-binding my second sketchbook, I’m hooked on this process in a way that I never thought I would be. I’ve said this before, but I’m finding it immensely satisfying to hand-bind a volume of my own hand-drawn sketches. 10/18/13 St. Paul's Church in Port Gamble. 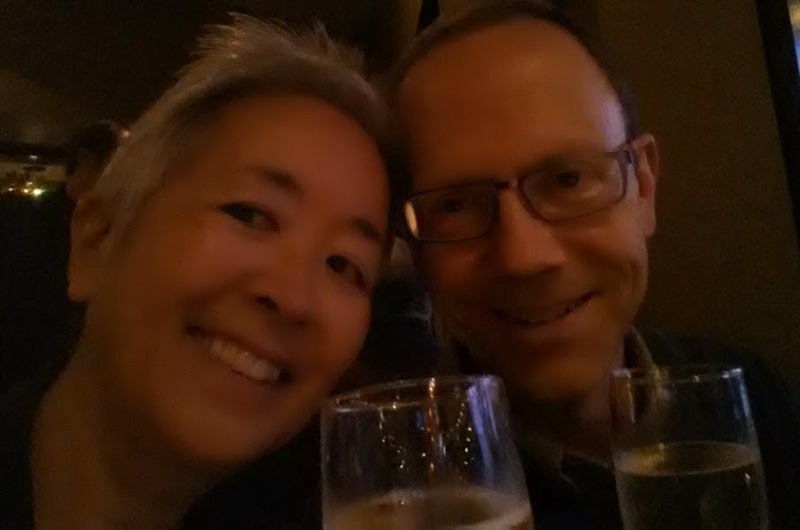 On Monday my spouse-guy and I celebrated our 24th wedding anniversary. 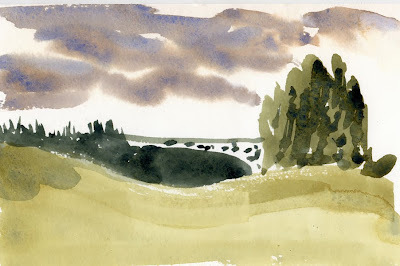 But that didn’t stop us from celebrating again yesterday in our favorite Fall day-trip getaway location, Port Townsend. This picturesque little town on the Olympic Peninsula is full of coloring trees, Victorian architecture and water views. A thick layer of fog made our ferry ride mysterious as distant land masses appeared as faint shadows. 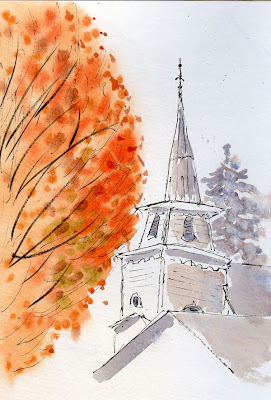 Driving toward Port Townsend from the Kingston ferry terminal, we passed through tiny Port Gamble, where I’ve always wanted to sketch St. Paul’s Church, which is apparently now used as a wedding chapel. I was freezing in the cold, damp air, and the trees, though gorgeous, kept dripping condensation on my head and sketchbook! 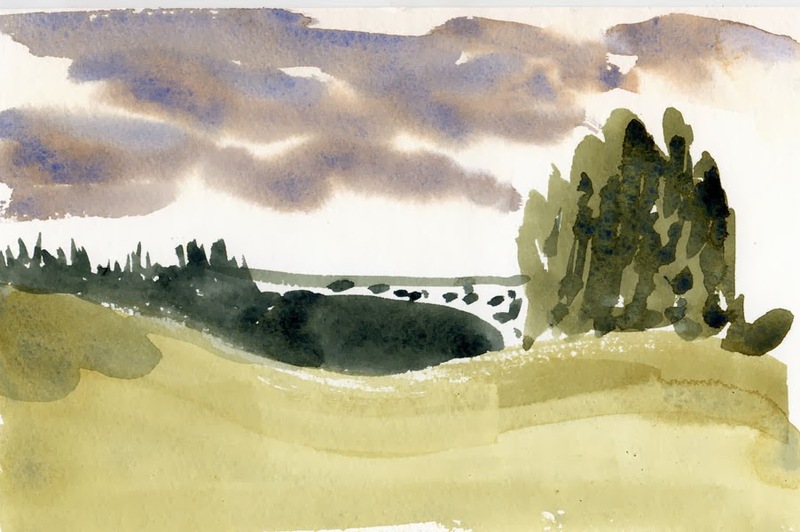 The fog didn’t lift until late afternoon, but it was a good opportunity to practice painting a foggy water view from historic Fort Worden State Park (where I had sketched the romantic Alexander’s Castle last year). Like last year, a family of deer wandered around on the fort grounds. 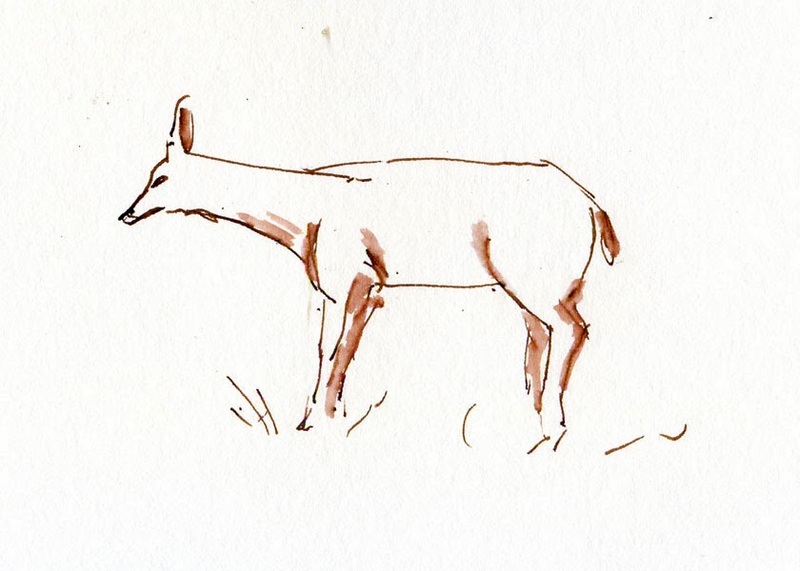 But unlike last year, they hung around long enough for me to catch a few gestural sketches of them. 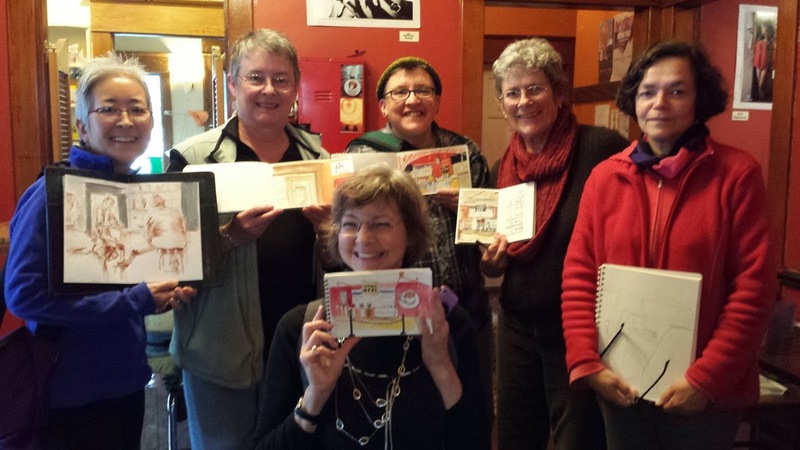 After hiking around the fort grounds, we went into town to warm up at Better Living Through Coffee, where we ran into the Whidbey Island Sketchers on their Friday sketchout. 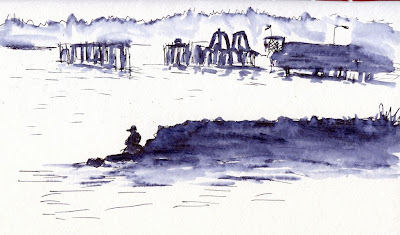 Braving the cold, they were sketching on the coffee shop’s porch, but we had to retreat inside, where I sketched the silhouetted ferry dock and a man sitting on the rocks next to the water. Before heading home, we had dinner at Fins Coastal Cuisine, one of our favorite Port Townsend restaurants, where I managed to sketch the full moon rising over the water through our table window (No, I wasn’t sketching during dinner – I did this in the few minutes that Greg was in the restroom!). So you might be wondering: What was Greg doing while I was making all these sketches? As crazy about photography as I am about sketching, he was taking lots of photos and videos. It bodes well for the next 24+ years. 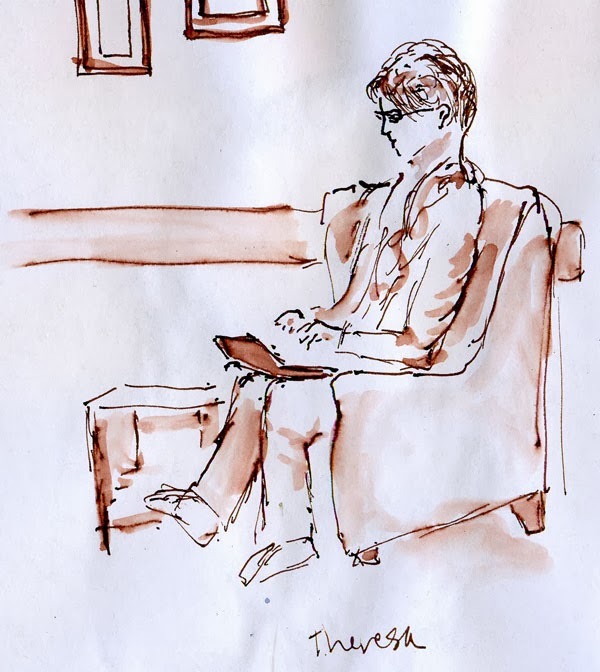 I warmed up with a sketch of Teresa and then a portrait of John (who was tracking the Seahawks game on his iPad). Then I moved to the other side of the café to sketch the fireplace and Mark sketching probably the fireplace. Only a few minutes’ walk from the place where I take my car to get its oil changed, the Burke Museum is an ideal place to kill an hour with my sketchbook (much better than waiting in that stuffy little room drinking weak coffee and using weak Wi-Fi). 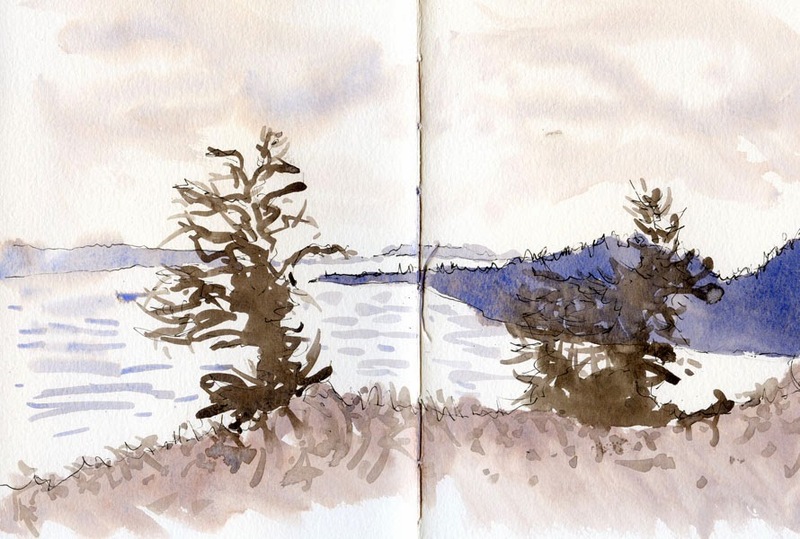 I decided it was also an ideal place to initiate my 2014 Sketchbook Project sketchbook. As a participant last year, I had fun filling the little sketchbook, but I didn’t feel particularly compelled to participate again – until I heard that Arthouse Coop is going to take the exhibit to the Pacific Northwest in 2014, including Seattle. I couldn’t resist that, could I? I signed up again. Last year I chose the theme “Strangers” and filled the book with mostly “floating head” sketches of people in coffee shops or riding the bus. 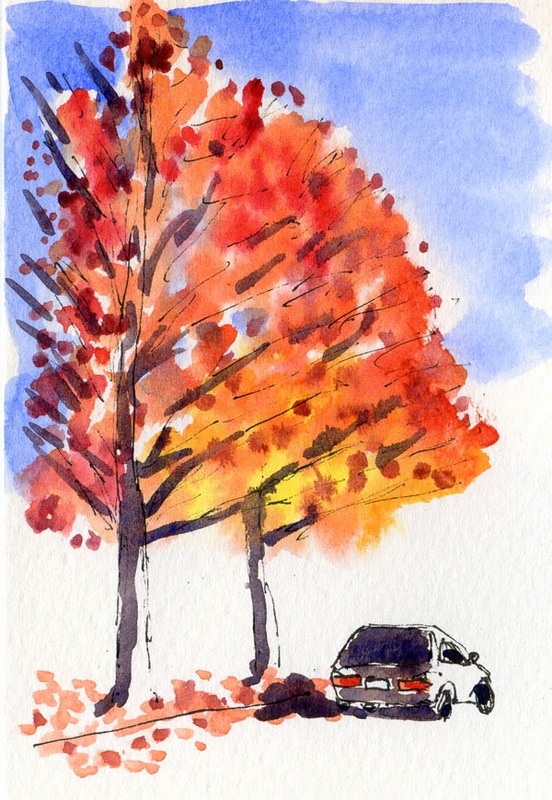 I haven’t decided on a theme yet, but since I’ll still be working on it during the Fall and Winter, I’ll probably be sketching indoors most of the time. 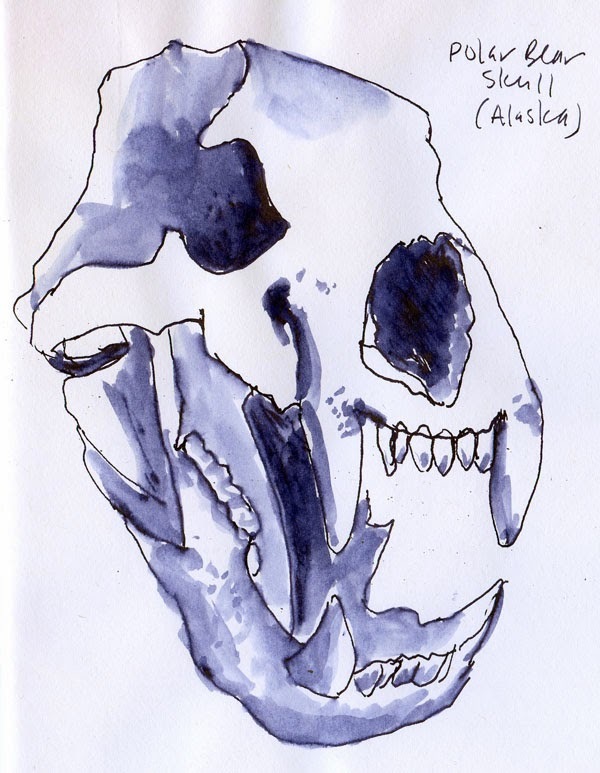 I’m sure I’ll still have lots of sketches of people, but maybe I’ll widen my scope to include other heads, such as skulls. 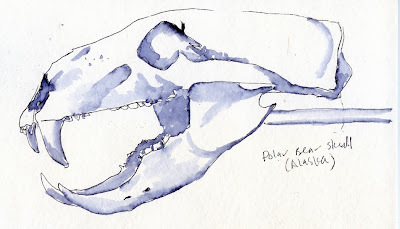 In any case, I didn’t give it much thought this afternoon at the Burke – I just pulled out the Sketchbook Project sketchbook because it was in my bag (I’ll carry it with me daily until it’s full – the best way to make sure I don’t forget to use it) and sketched a polar bear skull on page 1. Last year I discovered immediately that the thin paper in the booklet can’t take a wash, so as before, I’m not going to use watercolor in it. 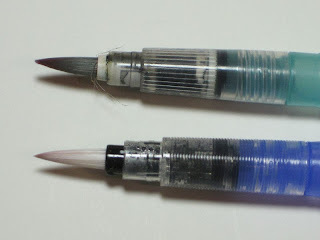 But the smooth surface is nice under fountain pens and markers. 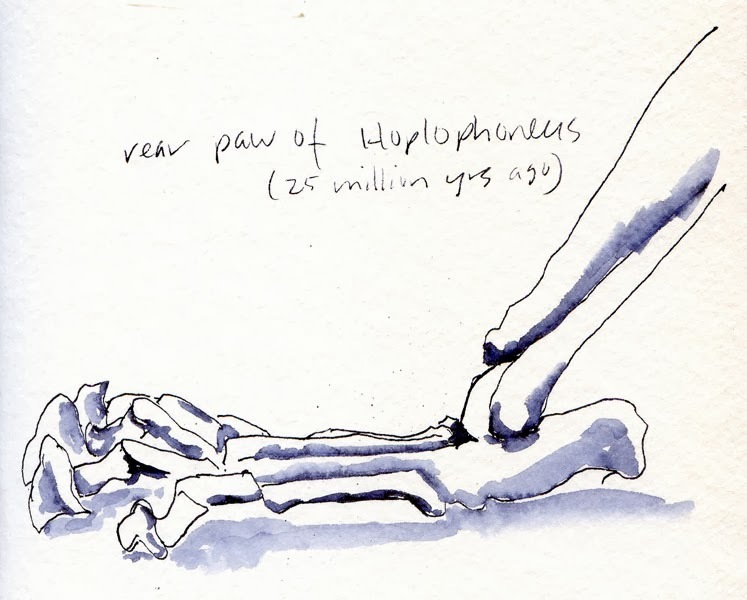 Having initiated the Sketchbook Project booklet, I used my “Stefano” for a couple more sketches: the same polar bear skull from a different angle and a rear paw of a Hoplophoneus skeleton (which I sketched in its entirety earlier this year). By the way, if you’re wondering how I can afford the luxury of popping into a museum for only an hour, please indulge me for a moment as I step onto my favorite soapbox: the reciprocal museum program. My spouse-guy and I already had an annual membership to the Bellevue Arts Museum. 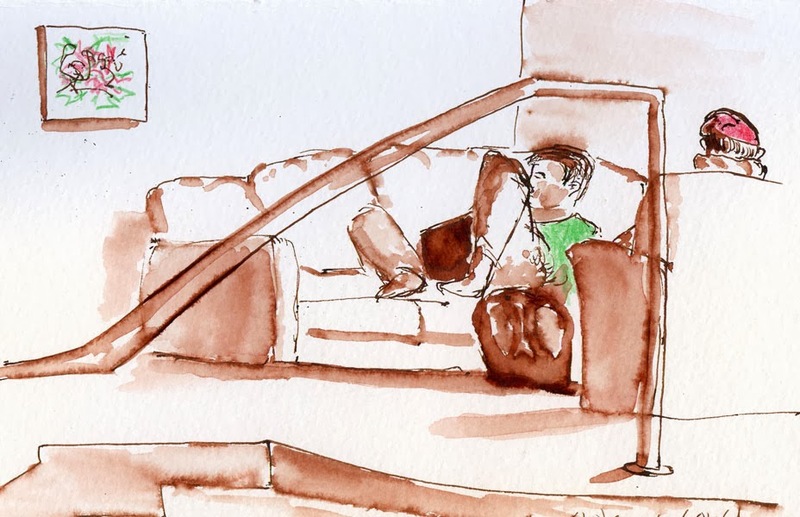 We learned that if we paid only $10 more to upgrade to the next level of benefits, we would get free admission to hundreds of other museums in North America, including several local ones where I enjoy sketching, such as the Burke and the Museum of History and Industry. When we travel, we look at the list of participating museums to see if we’ll be nearby one of them. It’s an amazing value, and you support a whole network of museums in the U.S. Canada and Mexico. OK, end of soapbox. But don’t forget to check out the North American Reciprocal Museum Association’s list to see if you can take advantage of this great deal. Just as I was griping about the sun not breaking through today’s fog, there it was. I walked a few blocks to Banner Way Northeast, a diagonal street that runs parallel to Interstate 5. With the roar of evening rush-hour traffic below me, I tried to capture all the long shadows reaching toward a glorious stand of maples. 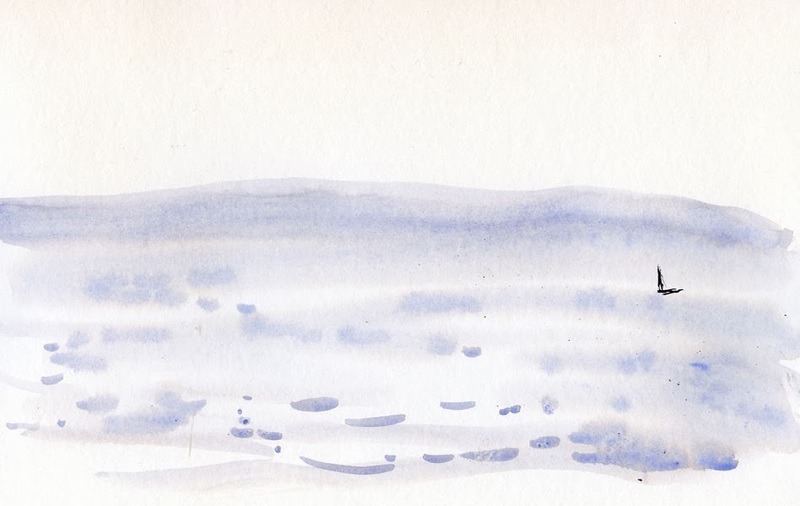 While working, I’ve been looking out the window all day for the sun to break out of this morning’s solid fog bank and now overcast sky so that I can go sketch some trees that are demanding a strong, slanted light. I kept thinking that when the sun finally came through, I’d drop everything and dash out the door. But it’s now almost 4 p.m., so I’m having doubts about the weather man’s promise. Go read the rest of his post. (I don’t have a sketch for today, so I’m posting this one from several months ago that never got posted.) Hey, the sun! Gotta run. 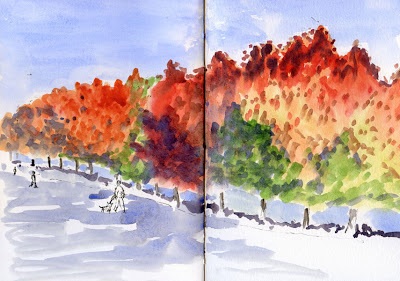 Here’s my favorite stand of maple trees at Green Lake, which I’ve sketched many times in all seasons. All summer these trees looked almost identical when they were green. Yet today, on a brilliantly sunny afternoon (the kind of Fall day we missed out on all of September), each is a different combination of hues. They all stand next to each other all day, all night, year after year, receiving the same number of hours of daylight and the same amount of rain. Yet somehow they all end up so different in the Fall. This reminds me of when I’ve driven alone on long stretches of Interstate 5: All of us going in the same direction; all of us thinking different thoughts. By the time I finished that sketch, I was getting hungry, especially with all the delicious food scents wafting by from the market. 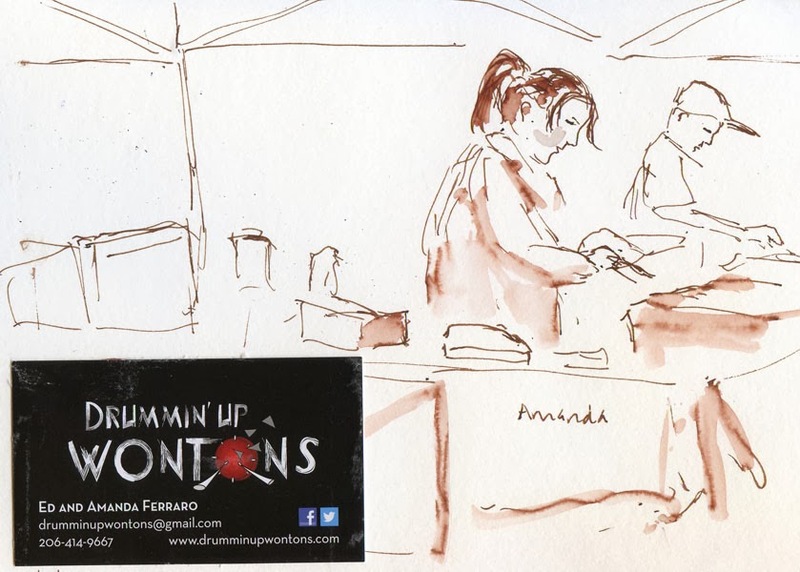 I found a vendor I had never seen before – Drummin’ Up Wontons – which serves up innovative savory and sweet wontons made to order. 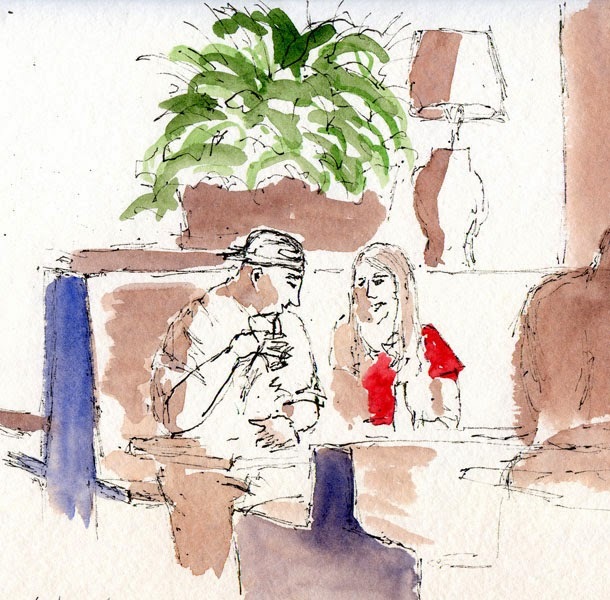 I sketched owner Amanda while I waited for her to make my combo order of mac & cheese and smoked salmon wontons (drizzled with mae ploy sauce – yum!). I scarfed those hot puppies down as I wandered back through the Commons chatting with other sketchers. Wouldn’t you know it? 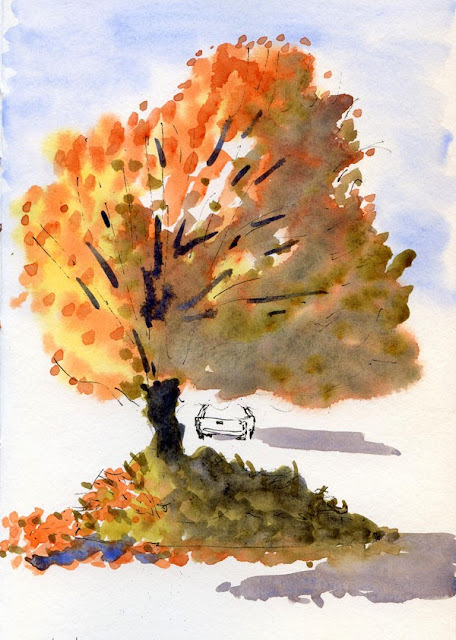 When it was time to leave, the sun came out, casting plenty of shadows, and it was warm enough to drive home with the top down. 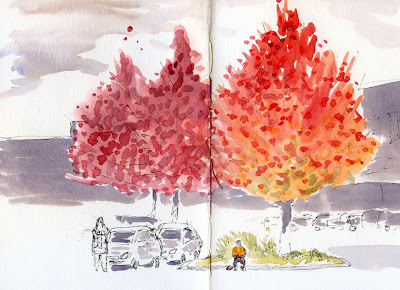 Yesterday Peggy Haug offered me some tips on making my trees look more dimensional. 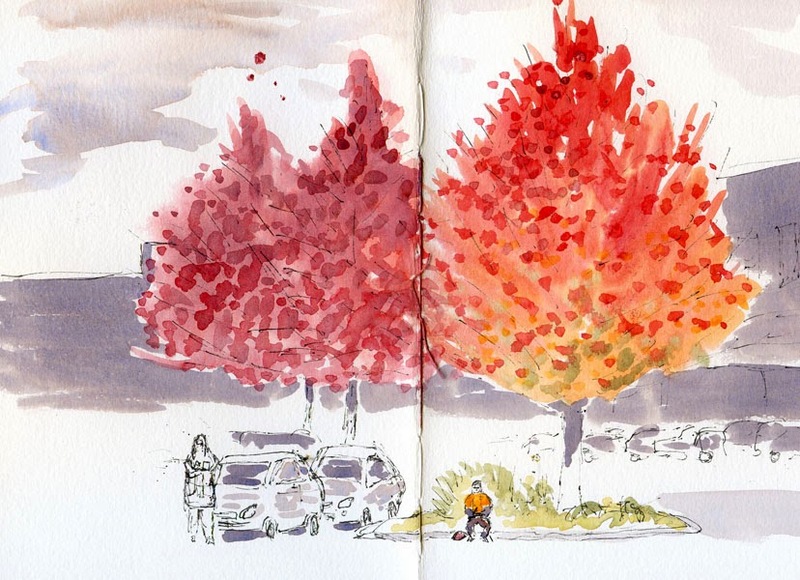 I think of Peggy as a tree-sketching goddess, so you can bet I listened. 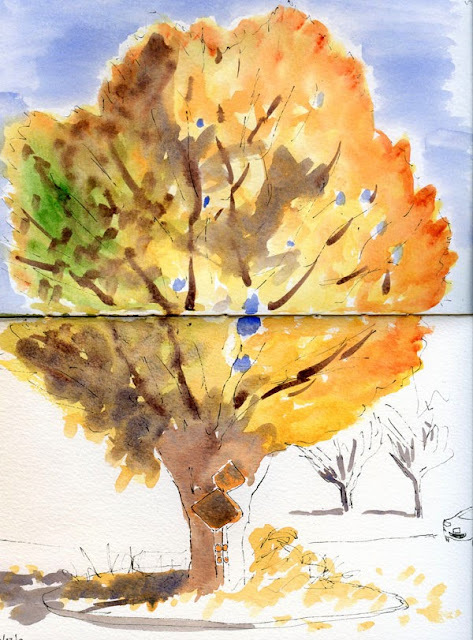 She suggested that I look for the shaded side of the tree, which isn’t always easy to see, especially when being dazzled by lots of brilliant colors. 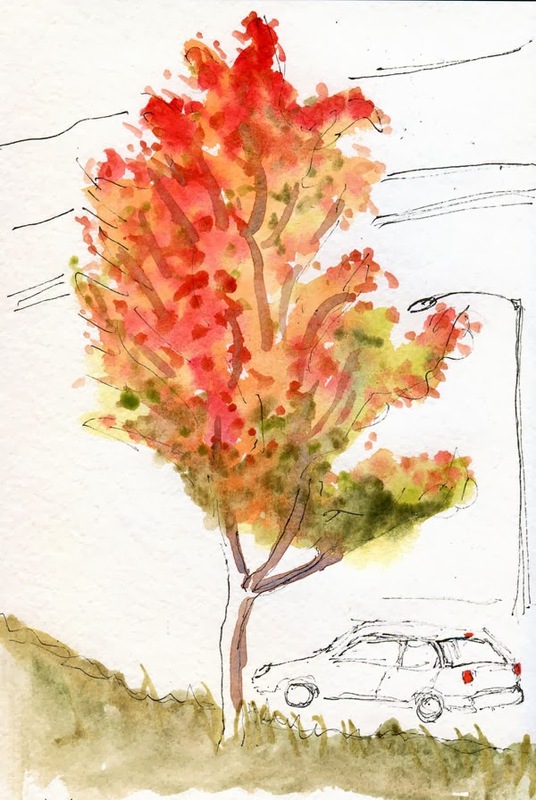 I looked back at my recent tree sketches with a critical eye and suddenly saw what she was talking about: I got so interested in all the bright hues that I had been forgetting that the same rules of light and shade still apply. 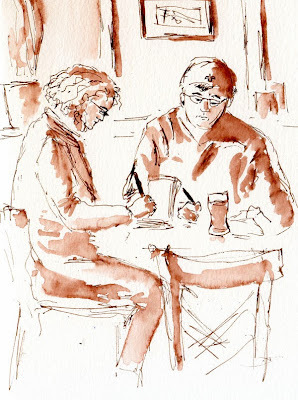 Lynne invited the Friday sketchers to sketch in her ‘hood at 6 Arms, a McMenamins pub on Capitol Hill. Well lighted with huge windows, the décor is Hindu-goddess-(with six arms)-meets-thrift-store-chandeliers, and we ate it up (along with our sandwiches and salads). After scarfing down my yummy grilled smoked mozzarella cheese sandwich, I warmed up with a sketch of the goddess mascot, mounted high up on one wall. I was almost done with the sketch when I noticed I had missed one arm! Luckily, I still had space on the left side of the page. With many interesting artifacts to sketch as well as good food, we decided 6 Arms is a keeper! We’ll be back.